Thank you all for your comments to my previous post. In fact, some of your arguments made me stop and think about my favorite of the colour blocking options. I guess I should reveal now that my early favorite was option number 1. 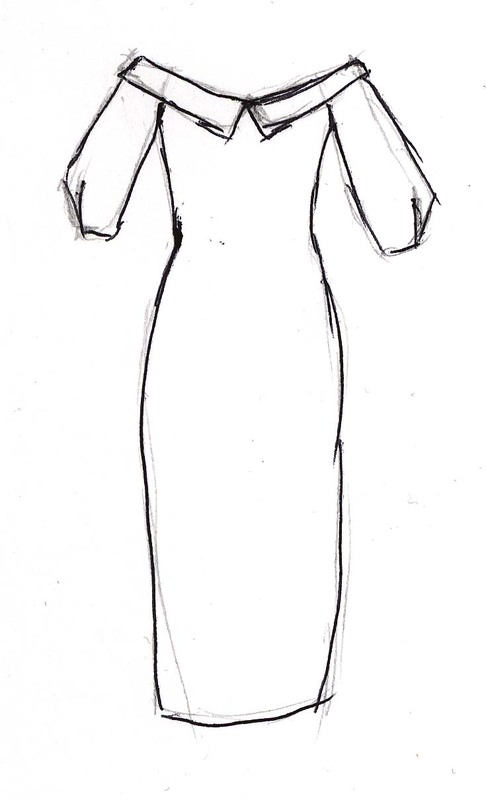 Before making those drawings, I loved the idea of the bodice/sleeve shape 3 and 4. I fully understand why 3 was popular with commenters, but seeing it made me think about how it would work for my shape: I already have and angular upper body, with the shoulders standing out more than the breast. 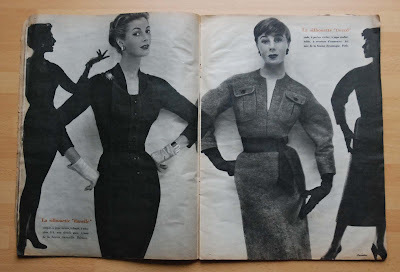 I think the angles created by the sleeve and upper bodice in 3 and 4 would emphasize that (making it a perfect design of all those with round or narrow shoulders and a large cup size, obviously). Option 2 is one I had sort of written off because I didn't think the lower colour block seam in the bodice would work well with a belt, but I have to say Radostin's comment made me think again (also because I like the fact that it's the only option I made with a non-black collar). And then, of course, several of you agreed with my original idea, thinking that the first option might be best. What I plan to do now is this: This dress may not even be the project I start on this week, but I will start on it soon, making sure the idea doesn't drift to the back of my mind again. I will explore the colour blocking a little further, taking option 1 as my starting point. I think I will stick with the two coloured bands at the bottom of the skirt, just because of my grandmother's story (I've actually met the friend of hers that story is about. At the time, she was also her boss at the hospital labratory where my grandmother worked before she had children and after her youngest went to school. Now, this friend is well into her 80's. A tiny, stocky lady who still is quite a character. She uses a computer, still drives a car and does charity events and plays golf every week. She's no longer that into fashion, but I'd love to have at least some of her spirit if/when I get to that age). Are you wondering why this dress may not be the first thing I make now? Well, it's the same old thing: I always have more than one project in mind. 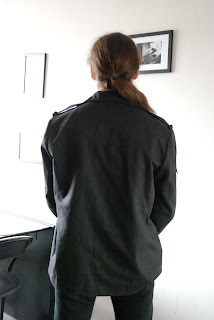 E's jacket is finished and between work and my mother coming home from the care home today (yeah! you go mum!) and still needing some help around the house in coming weeks (tasks divided between my dad, me, my sister and brother, so that will be quite all right) I won't have tons of time for very involved projects. So, I just plan on making whatever I like best. And at the moment, it seems to be all about one-piece outfits. 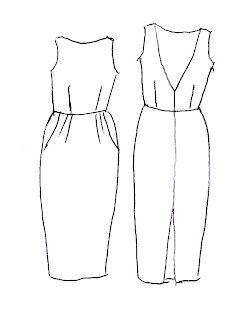 Dresses and jumpsuits. In everyday life, I love seperates and I have sewn so many of those but now, I just don't really feel like sewing any. 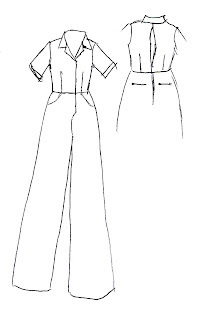 A jumpsuit with a bit of a vintage style workwear look. Another dress, strapless and with a huge skirt. To be made in cotton with a large-scale, fairly graphic floral print in yellow and brown on white. The fabric has been in my stash for two years, and I've always wanted for it to become a dress like this. A very plain and simple jumpsuit in a stable knit. 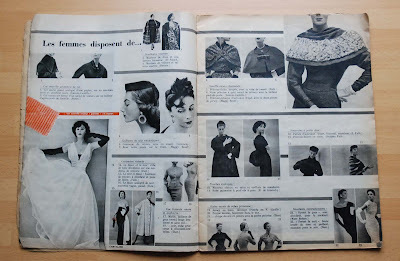 Do you know the pictures of Vionnet jumpsuits from the 1930's? That's sort of what I'm thinking about with this. Of course, it could go spectacularly wrong. 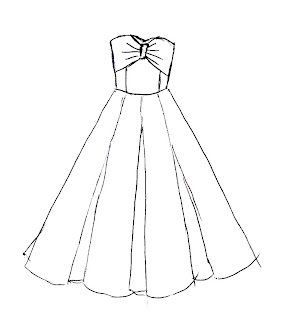 And, last but not least, friends are getting married on the first of June, so, obviously, I will have to make a nice little party dress. Although almost every bridal gown you see nowadays is strapless, I think with weddings being being mostly day-time events, a guest should (at least be able to) cover her shoulders. I'm thinking about making something like this, possibly with a little bolero or jacket, in a pink (!?!) jaquard-ish fabric I've just bought. As you see, so many plans... and by the way, is it just me being suddenly addicted to all-over looks or is 'having dresses in mind' just something which happens when summer is coming? Fortunately, I have been able to do some sewing today and yesterday (there has to be some advantage to being fit enough to be out of bed, yet not fit enough to be at work...). I'm working on another jacket for my boyfriend. Another black cotton one, for this spring. Just because he wears the one I made him in autumn all the time... 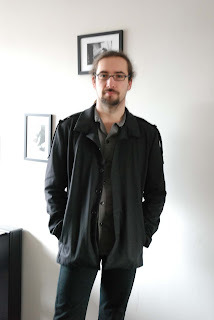 This time I'm not using the formal jacket block but the casual one, which I've used before for his winter coat. No pictures now, but I'll show it to you when it's done. 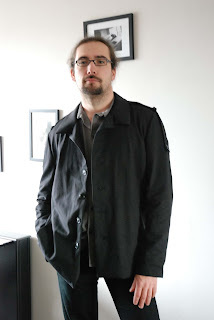 What I want to talk about now, is further sewing plans... 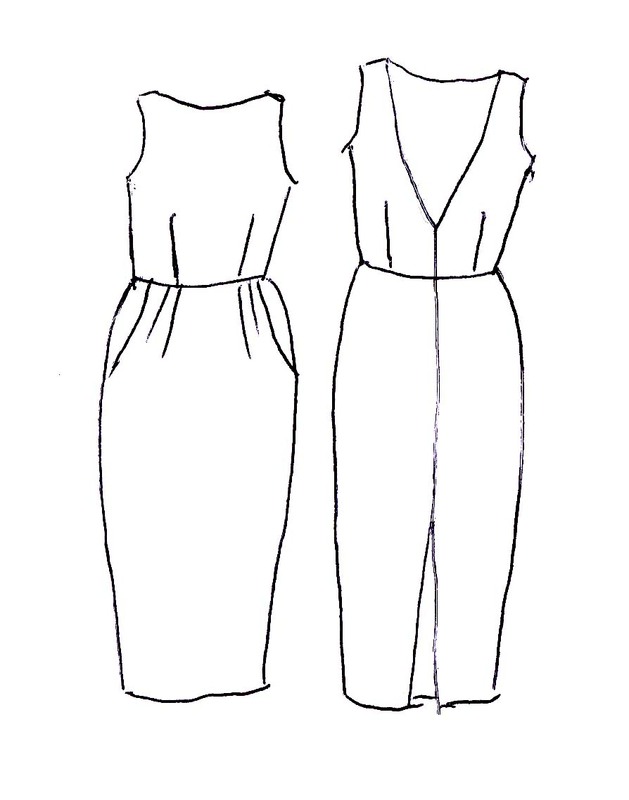 Dresses and jumpsuits, those are on my mind now. 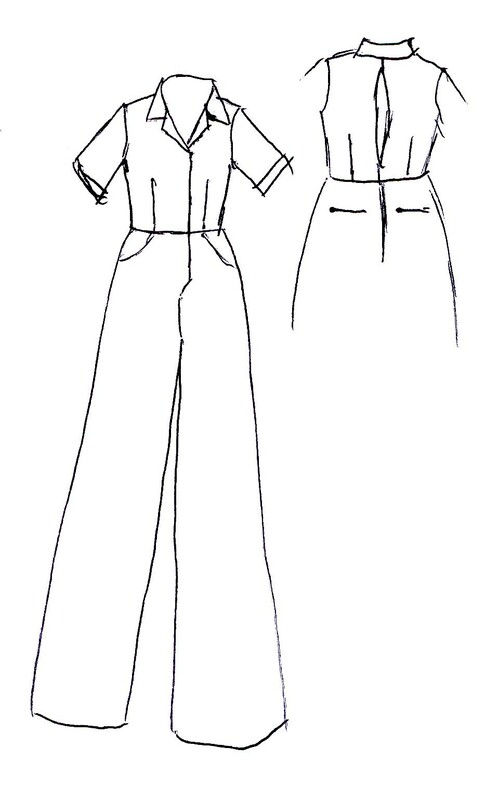 Of course, nice tops and maybe another pair of trousers would be more practical but also less fun. And, especially when I'm busy, I need enough fun projects to keep my sewing mojo up. 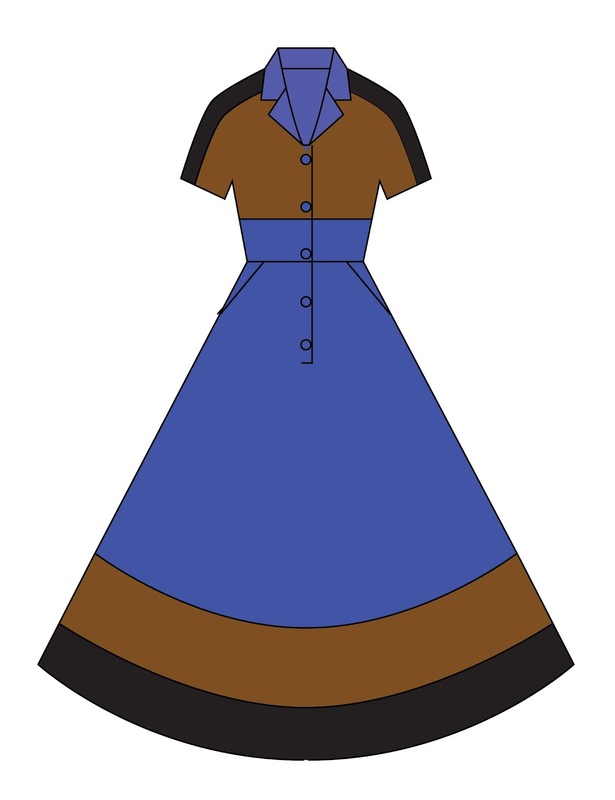 I'm thinking about a colourblock dress. A full skirted shirt waister, with some colourblocking, to be precise. In part because colourblocking is still very much in fashion, in part because Elizabeth has reminded me of that in her posts and in part because my grandmother once told me how, back in the early 50's, a fashion-conscious friend of hers would adapt to the new seasons' skirt length by adding bands of fabric in different colours to the bottom of her skirts. 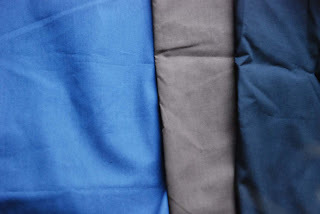 And because I've had this blue fabric in my stash for quite a while now. It is 100% cotton, a nice weight for a dress, the colour suits me and I've got lots of it but I have always thought it would look too uniform-y if I would wear it all-over. So, colourblocking could be the way forward. 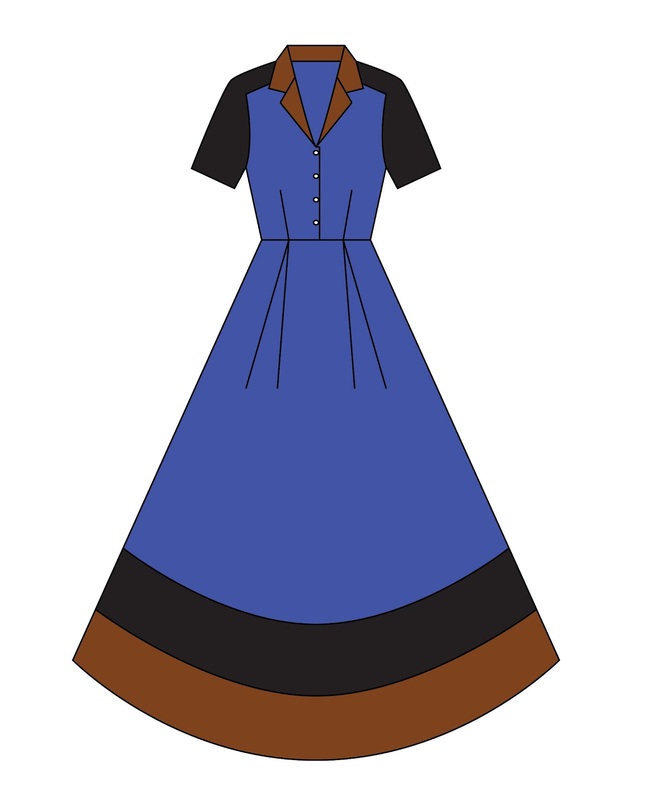 I plan on drafting a fairly simple shirt dress with a full skirt (circle or wide with pleats), a waist seam, fitted bodice and short sleeves. 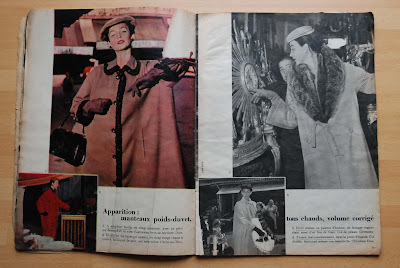 I made the sketches with two different kind of sleeves: kimono (with underarm gusset) and set-in with shoulder extention (the first is more of a 1950's style, the second is more 1940's). And then, I just played around with the colourblocking. 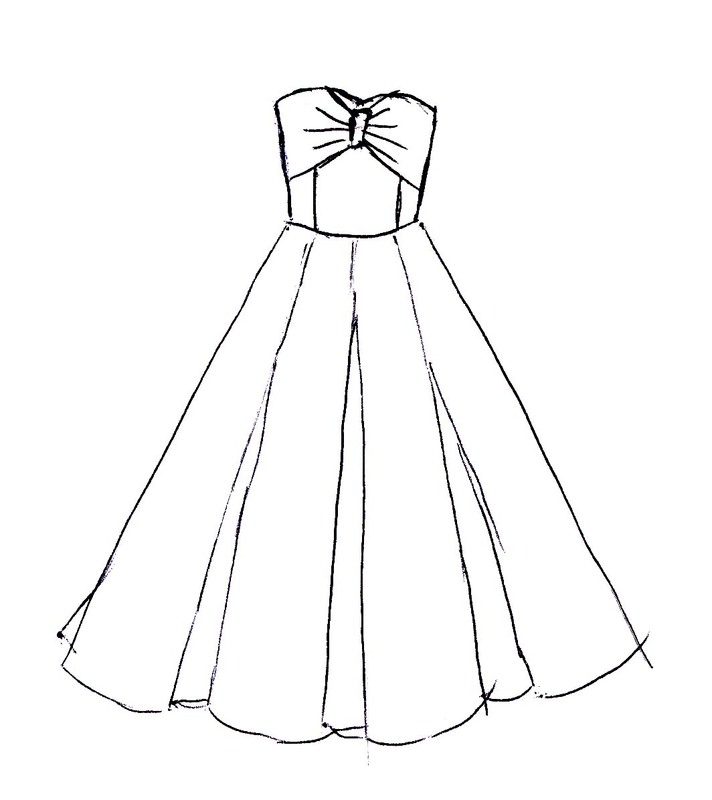 The main part of the dress will be in blue, that's a given. And I keep in mind that I usually wear my black belt with all dresses in this shape. I think I'm starting to prefer one over the others, but I'd love to hear what you think. Which one is your favorite and/or what else should I try? P.S. This new blogger-interface is frustrating. Does anyone know how to leave one blank line between lines of text? Now, just pressing the return key seems to generate two, which stretches the text out in a weird way. 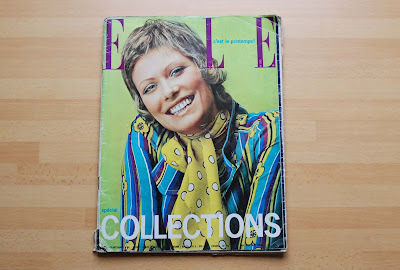 Didn't I tell you I went to Amsterdam last week to pick up a couple of vintage magazines which I had bought at a Dutch auction site? 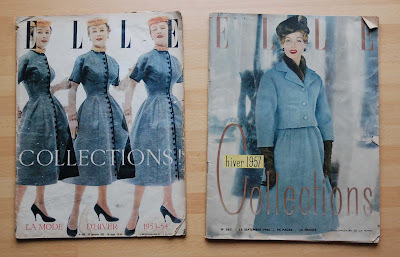 The collection specials for winter 1952/1953 and winter 1957. And the spring collection special for 1971. Two of these, the seller gave to me purely because she liked my enthousiasm. And I'm not just showing you the covers, at the risk of making anyone jealous. I'll show you what's inside the first and oldest one now (warning, this makes for a very picture-heavy post). 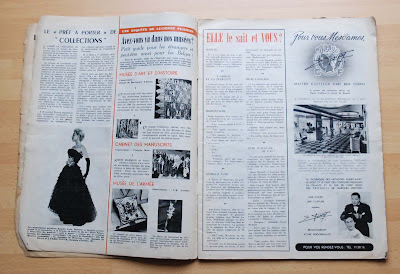 Obviously, there are several pages of normal magazine stuff: a letter from the editor, a small article and a segment with letters from readers on these pages (there's even a short story at the back), oh and adds, of course. 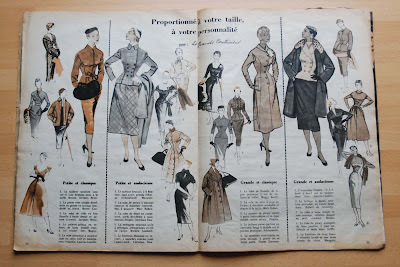 Then, it's on to serious fashion news: ever since the introduction of the New Look in 1947, hemlines were a major issue in women's fashion and Dior especially announced the new fashionable length each season. A length measured from ground to hem. 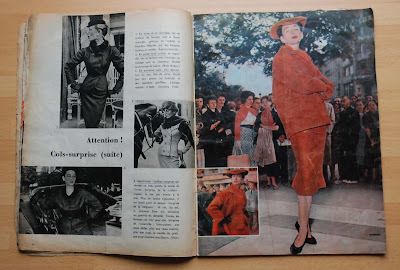 In this spread, it is shown, with three models wearing Dior dresses, how women of different height should deviate slightly from this dictat to achieve the desired fashionable effect. 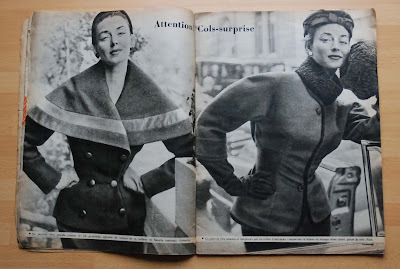 And if I understand the text correctly, Elle didn't make this up, Dior wanted it so. Then, there's an overview of interesting new things for the coming season. 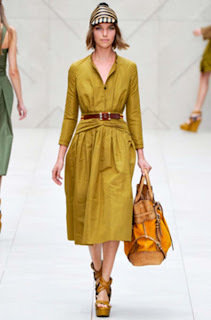 Collar shapes and fabrics and colour combinations. 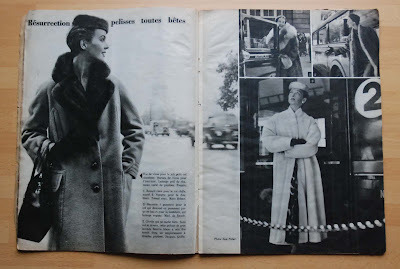 The big feature is all about coats. Neat suits and overcoats in various styles. And there are winter dresses. 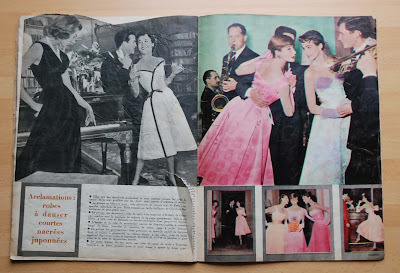 Then, there's this spread on dresses for dancing. 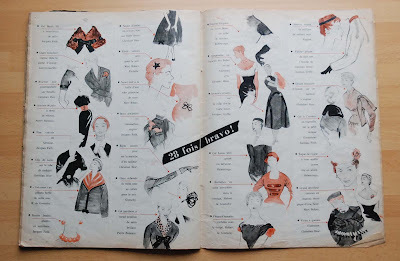 And the fashion oracle of Elle leaves it's readers with a line-up of the 28 new fashion details in approves of. Collars and ornaments in specific, sometimes unexpected places mostly. It has been a bit of an odd week. I thought I would have lots of time for sewing last weekend, because we had Monday off. However, I got ill on Saturday evening and spent all of Sunday in bed. By Monday I was sort of back on my feet, so I could at least visit my mother in hospital (she had the first of the new hip replacement operations the Friday before. All went well an she is now in a care home, until the new joint is settled in place well enough that she can get up and down a flight of stairs without risk). So, no sewing time left. 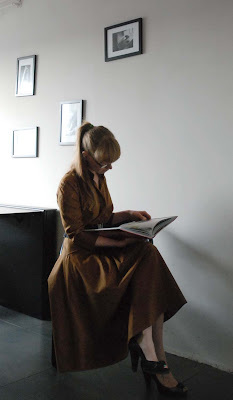 On Tuesday, I finished a jersey dress which should have been quick and fun and which hasn't been photographed yet. Rather than passing up the purchase for this inconvenience, I decided to go and make a day of it. First, I picked up the magazines from a very nice, no-nonsense kind of lady who had bought most of these herself, back in the day (she said there were no Dutch glossy fashion magazines back then, so if you wanted anything other than the general interest stuff for housewives, you had to buy French... very interesting) at the edge of the canal area in Amsterdam's city center. Then, I walked to the handbag museum and spent a while there. The museum of Bags and Purses is located in a splendid building along one of the main canals and houses a dizzying aray of bags from the 16th century till today. It started out as a private collection but is now a serious museum, open to the public every day and with both its permanent and changing exhibits well displayed and explained (also in English). A lot of museums might be quiet on an ordinary Thursday afternoon, but this one wasn't. If a museum dedicated to bags sounds like a girly dream come true, certainly a lot of people thought so. And I don't think they were disappointed. I know I wasn't. In fact, if you are visiting Amsterdam and are into that sort of thing, I heartily recommend it. After that, I took a little detour on my way back to the train station to stroll along the 'nine streets'. This is a nice little shopping district, tucked away from the big chain stores in nine narrow streets between the canals. It houses a nice mixture of stores: vintage clothes, vintage interior stuff, independant designers, artisan soap makers and bakers, novelty shops and some small outlets of bigger chains. One of Amsterdam's worst kept secrets, but still nice. I was sort of good and only bought a hat at one of the vintage shops. 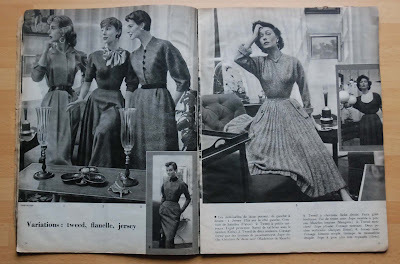 I'll be back tomorrow with pictures of that new dress, and I will try and catch up with showing you some of my new-to-me vintage magazines over the coming weeks. 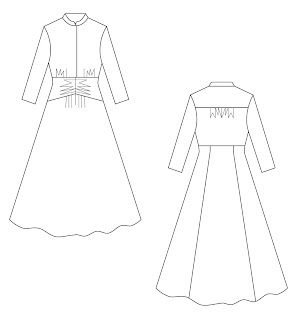 The bodice has a waist seam at 5 cm above the natural waist, slim, set-in sleeves, gathering at the bust, a blind button band and a back yoke with gathers. 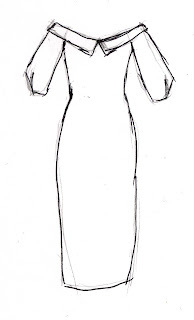 The waist/hip piece is only at the front and is gathered only in the middle. I don't think that part work exactly the way I wanted it to. It should be more tightly gathered and I'm not entirely sure about the placement: I didn't draw it tight over the hips because I didn't want to mess up the fall of the skirt. That worked, but now I'm wondering. I'm only showing these pictures for the details. I planned for this dress to be worn with a belt, and that's how I like the look of it best. I used a simple technique for the hem which I hadn't used before: I made a 10 cm wide hem facing to which I applied a lightweight fusible interfacing. This gives the bottom of the skirt extra weight and a more dramatic swing. It's like a 'light' version of the horsehair braid effect, perfect for a casual dress in a simple and lightweight fabric. 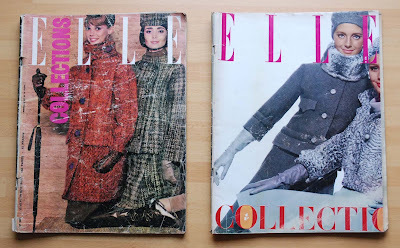 And yet this magazine, along with a bunch of others owned by the same budding seamstress (I'm guessing at that. this pile included Marions from the 1950's and 60's. 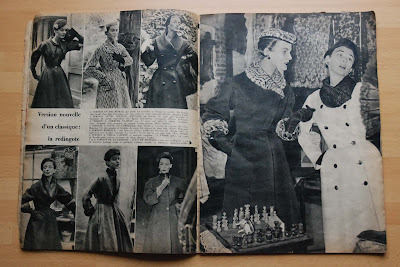 In all the 50's ones, the pattern sheets appear to be untouched but several issues from the 60's show the marks left by tracing wheels) survived it all, just to be sold to me by the lady's grandchildren...So, I'm happy to show you the contents of the April 1956 issue of Marion (a Dutch sewing magazine which, as far as I know, was published from the late 1940's to the early 1990's). 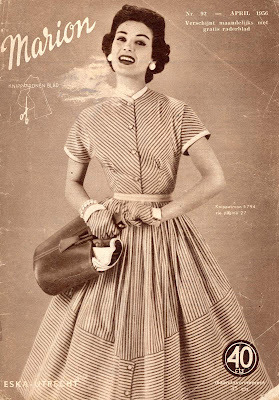 The cover shows a quintessential mid-fifties look: a full-skirted shirt-waist for which they have made clever use of the striped fabric. With matching gloves, a pattern for which was included if you bought the dress pattern. 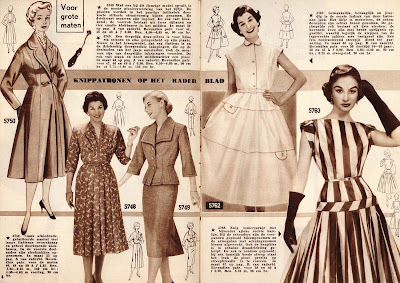 As in every issue of Marion, patterns in one size were included for some of the looks. 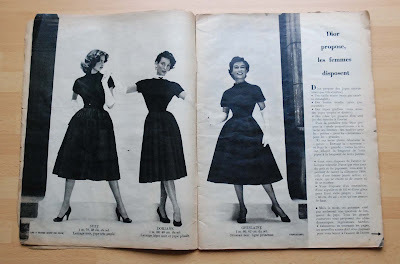 Here, the elegant, sleek coat and dress on the left were included for plus sizes, the sophisticated suit, or 'deux-pieces' (which indicates they saw this as a two piece dress, rather than as a proper suit) was avaible for mid-sizes (42 to 48) and included in size 44. 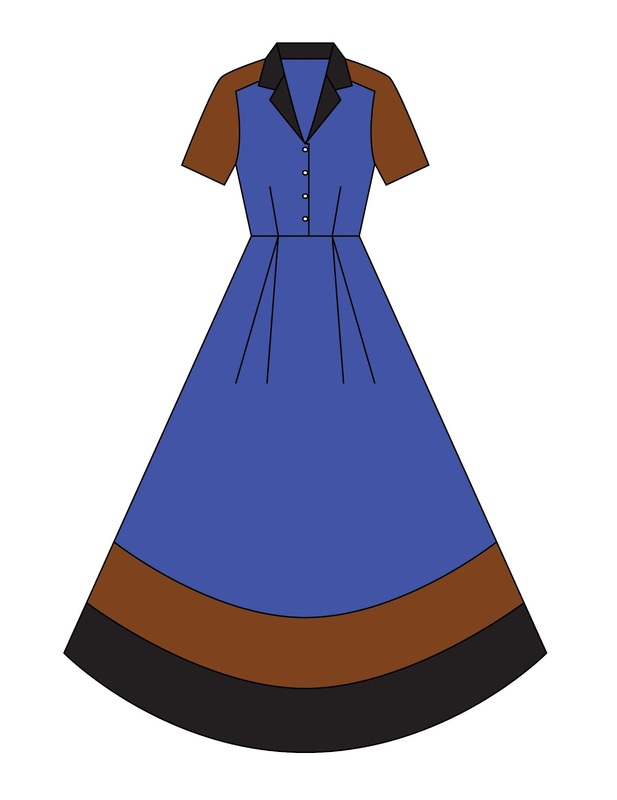 The cheerful white dress with the impractical pocket obsession was considered to be more something for the young woman. The striped number to the right actually shows a trend which was on its way in at the time: the dropped waistine complete with fake belt at the high hip. 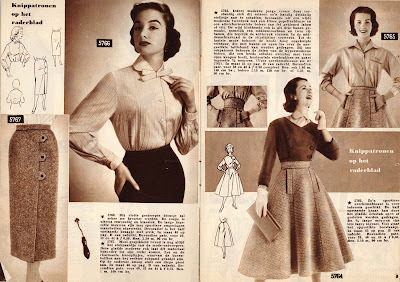 Then, there are some seperates: A darling blouse with collar and bow and a pencil skirt with decorative button tabs. The outfit on the right is included in its entirety (in size 42): Full skirt with pockets, matching belt, blouse and bolero. 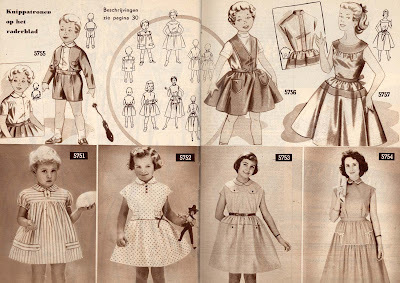 And of course, there were always children's patterns as well. These all came with patterns. 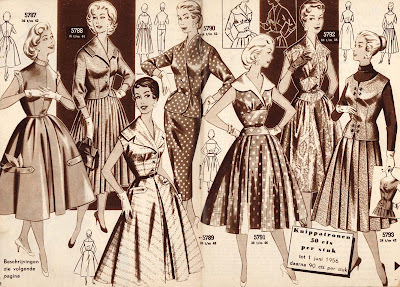 The dress at bottom right is actually included in ladies size 36, which is also for girls of 14 to 16, according to Marion (and which happens to be closest to my size...) Is anyone else slightly freaked out by the 'too young for a wasp-waist' look of the girls' dresses? And there were wedding dresses (on the right) and party-clothes for kids. 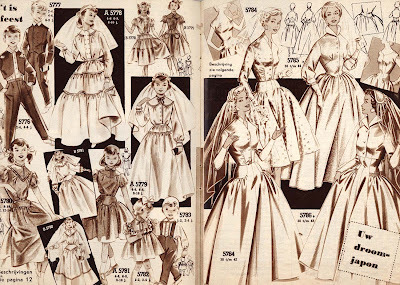 Those 'bridal dresses for little girls' are only described as being 'festive' which seems a bit odd to me. My guess is that they were either for bridesmaids and flower girls or to celebrate first communion. 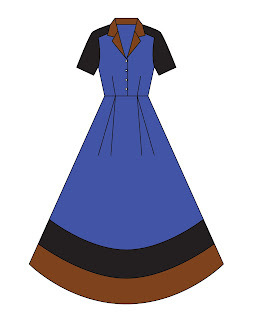 Personally, I see a lot of design elements I wouldn't mind incorporating in my summer looks (the warmer weather has me back to thinking about vintage-style dresses already). Is there anything you would wear today? P.S. I hope to be able to show you my first spring dress tomorrow.